Why Consider Staying at The InterContinental New Orleans? New Orleans is a superstar U.S. destination. You can't call yourself an American luxury traveler if you've never been here. Why? New Orleans offers visitors a variety of lodgings: deluxe, true luxury hotels; business hotels; quirky boutique hotels; flavorful guest houses. 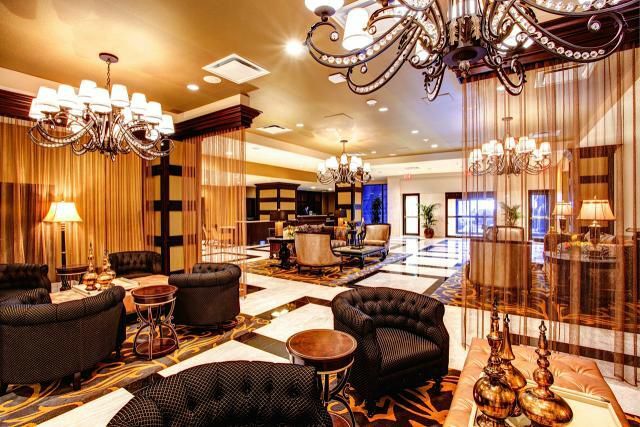 Will the InterContinental New Orleans Be Your Style? Will You Like Staying at The InterContinental New Orleans? The InterContinental New Orleans is large: 484 rooms and 32 suites. This is a modern hotel that was renovated from top to bottom in 2015. Every room was renovated. They are handsomely done in the hotel's color scheme of black and gold. Rooms are neither noticeably spacious nor cramped. They are comfortable and intelligently laid out. The InterContinental New Orleans is known for its appealing dining. The hotel offers a signature restaurant with a bar plus a casual spot for breakfast and drinks. Trenasse, a Cajun term for a stream, is the hotel’s stylish lunch and dinner restaurant. The hotel's excellent breakfast and lunch spot, Pete's (pictured), features notable wall murals that channel New Orleans in the Jazz Age. If you're coming to New Orleans for Mardi Gras, the InterContinental is the perfect place to stay. The InterContinental takes fierce pride in its ideal Mardi Gras location. The hotel is set right on St. Charles Ave., the main parade route. As is common in the travel industry, the Luxury Travel Expert was hosted by the hotel for the purpose of describing it. For details, see our Ethics Policy. Where Should Visitors Stay in New Orleans?